Attends Large Adult Washcloth Refill. 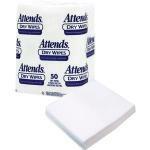 Hypoallergenic, Alcohol Free, Pre-Moistened. Contains Aloe. 12 Packs Of 48 To A Case. Sold By The Case Of 576. 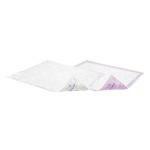 Attends Washcloths Convenience Pak 8" X 12.5"
Attends Light Pads Regular Protection, 8.5". 9 Bags Of 22 Per Case. Sold By The Case Of 198. Attends Light Pads, Extra Protection, 10.5". 9 Bags Of 20 Per Case. Sold By The Case Of 180. Attends Insert Pad 4, 3.75" X 11.5. Sold By Case Of 192. Attends Booster Pad, Use With Brief, 3.75" - 11.5". Sold 192 Per Case. Attends Guards For Men, Unisize. 4 Boxes Of 16 Per Case. Sold By The Case Of 64.